Settlement Funds - Gateway to Canada | Canada Immigration Consultancy! One of the considerations by a Visa Officer in making a decision on a permanent resident visa application is the applicant's funds available for settlement in Canada. The amount of funds required varies depending on the number of applicant's family members, regardless if accompanying or not. This is commonly known to many as Show Money. The amount required is listed in the table below. 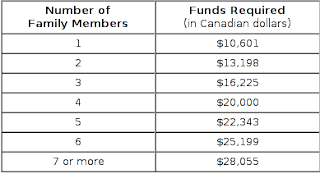 The amount may change depending on the assessment of Citizenship and Immigration Canada. The required settlement fund is waived if the applicant has arranged employment in Canada. The best was way to show proof of funds is by means of a bank certificate. While it will help if you can also show bank transactions history (i.e. bank statements, old passbooks, etc), but it isn't necessarily a problem if you can't present one. What is important is that you can explain where did your money come from and to be able to provide supporting documents.